This article is reposted here from www.rememberthegoat.com. It has been shared widely here in Kenya and was published in the Star newspaper. It tells the story of one day in the Olng’arua community as well as how the security issues are affecting us and the wider community. There have been many such days and until some of the underlying problems are resolved we sadly expect to see more of them. The shooting of Kuki Gallman was a terrible thing and it made international news. It was not terrible because she is white, or Italian (though now a Kenyan citizen) or because she is famous (Kim Basinger played her in the movie) or because she is rich (I don’t actually know if she is but it certainly appears that way). It’s not even terrible because she has made an important contribution to wildlife conservation in Kenya. It’s terrible because it was a violent crime and all violent crime is terrible. Since the ranch invasions in Laikipia made the headlines many people have voiced the opinion that the violence is in some way understandable, or even justified, because “colonial white settlers” have stolen ancestral land. This view would have had a great deal of sympathy from me if it wasn’t for the fact that Kenyans have been fully in charge of Kenya for more than 50 years. This Mugabesque tactic is a very convenient way of hiding a much bigger problem behind an emotive issue. 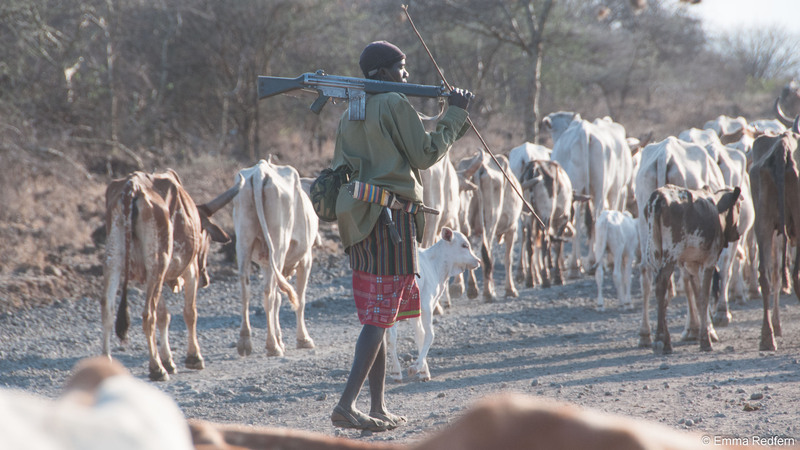 The day before Kuki Gallman was shot I was also confronted by armed and aggressive herders. Beyond the fact that I too have looked down the wrong end of a gun there is no similarity between Kuki Gallman and myself. Admittedly I am white, and I am also female, however I do not own any land in Kenya and being married to a local Kenyan I don’t run in the same social circles as most white Kenyan families. I don’t own a plane and I regard smart shopping as going to the AKK supermarket in Isiolo town. In short most would struggle to class me as a white colonial oppressor of the Kenyan people. And this is the point, the noise being made about the few wealthy (and mostly white) ranchers that are being subjected to violence, obscures the fact that thousands of ordinary people are also being subjected to this kind of violence, and in many cases much worse. On that Saturday I was attempting to keep around 2000 cattle, and a large number of aggressive and illegally armed men, out of the last remaining spring in the small village that I live in. Because of the drought all other water sources in the area have dried up and the fragile spring is all that is left. The steep dry sides of the spring could easily collapse and destroy our only water source. It would take far less than 2000 cows to make this happen and for that very reason the local community are careful to keep their own animals out of it. Without the spring the local school would have to close and the whole community would have to move away to somewhere else where they could get access to water. So, when the cattle started to arrive, I stood with the one Kenya Police Reservist stationed in the community, and attempted to save the spring. We stood alone against the invasion because the rest of the community were far too afraid of the men who came with the cows to stand with us. I don’t blame them. 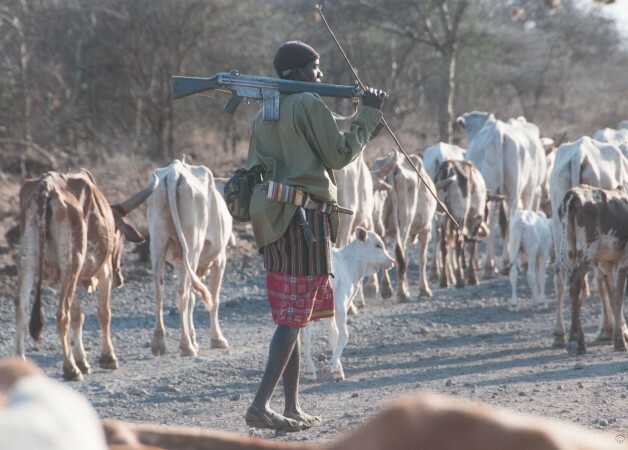 Members of the same group have, over the past two years, repeatedly stolen livestock from our own and neighbouring villages, they have shot at homesteads containing women and children and ambushed and murdered local men out with their livestock, the most recent case being an old man who simply could not run away fast enough. In the remote Kenyan bush nobody really expects to suddenly come across an angry white woman and that might go some way to explaining why just the two of us, against such well armed opposition, succeeded in keeping the cattle out of the spring and not get shot. Though had it been the day after Kuki Gallman was attacked, rather than before, I might not have been quite so brave in the face of so many guns. This is not the first time this year that we have had to save the spring from destruction by invading herds nor do I expect it will be the last. Local people water their animals where the spring flows out into a sandy seasonal river bed, there the livestock can drink without damaging the spring itself. The herders who came that day, who have been repeatedly invading the area over the last two years, must surely also know this. To try to take their animals into the spring itself suggest that not just water but also destruction, intimidation and the removal of the local community from this area must be their ultimate aim. We should not be blinded by reporting that might suggest a righteous black struggle against a white colonial oppressor. The violence of Kenyan against Kenyan, criminal against innocent victim, is so much more extensive and much more significant to the future of Kenyans, both locally and nationally. The big story here is the thousands of ordinary Kenyans who are being affected by this violence; ordinary homes being destroyed, livestock stolen, shambas stripped bare, children huddled in fear as they listen to gun shots night after night. Woman raped by armed men confident that no one will stop them, women, children, the elderly and unarmed, shot, injured and killed. Arrests for these crimes are so rare as to be non-existent, shooting a white person might get you into a bit of trouble but you can attack other Kenyans with impunity. I have been watching this unfold in our area for the last 2 years and I wonder, where are the journalist who are prepared to name the instigators of this violence or those that ensure the criminals can act without consequence to themselves? Because most of these people are known to the communities involved. Where are the police who are prepared to maintain the rule of law regardless of any pressure on them to turn a blind eye? And where is the Kenyan government who should put the safety and security of their people before all other considerations? Mugabe used this trick to distract the citizens of Zimbabwe from his failures in governance by blaming the few remaining white ranchers for all the country’s many problems. I hope that Kenyans are not so easily duped. White owned ranches are not the story or the problem. Dispossess the white ranchers and give the land over to pastoralists and they will succeed no better than the Zimbabwean farmers did. This is because the government will still not be supplying quality education, growth or development in the pastoralist lands of Kenya. Rangelands will continue to be degraded, man made droughts will increase and the horror of mass livestock death and human suffering continue. This is what every pastoralist should be thinking of as we head into the elections. When you watch your animals die is it really because some white person owns a ranch or because your own government has ignored you for decades? I know I am going to watch our livestock die this year (the animals we have left, the ones that haven’t been stolen). I’ve watched them die before, in previous droughts, and the pain, futility and hopelessness of it is almost indescribable, but all pastoralists know it. Instead of fighting amongst ourselves, or against some fabricated enemy, we should be coming together to hold the government to account and to demand the kind of development and support we need to ensure that we don’t have to go through that pain again.